Temple Grandin is perhaps the world’s most-recognized authority on farm-animal welfare. As the subject of an admiring HBO film, she has a lot of fans. Foremost among them are journalists on the agriculture beat. Whenever an animal-welfare perspective is required, it seems the first person tapped for a quote is Temple Grandin. But Grandin is a paid industry consultant. She profits financially by designing industrial slaughterhouses. She supplements her income by writing books and delivering speeches about those designs. Whatever animal welfare advice she offers should always be framed in the context of her monetary connection to industrial agriculture. It should also be noted that big agriculture—big beef in particular—adores Grandin. She approaches agricultural “reform” from a compellingly safe perspective, one as much informed by her Ph.D. in animal science as her autism. The notion that Grandin’s autism provides unique insight into animal perspectives curries considerable favor with the general public, thereby further enhancing her credibility and reputation as a person who cares deeply about animals. Big Ag plays on this association brilliantly. Journalists help them do it. Grandin’s allegedly unique connection to animal lives is routinely reified through visually arresting images. Here’s Grandin hugging a horse. Here she is surrounded by a brace of cows. Here she is petting a pig. Never do we see Grandin with an animal being slaughtered. That would sully the image. Obviously, one would think, Grandin’s empathy for these animals runs deep, deep enough at least for us to trust her as a viable source of information on their welfare. But her real job is to help agribusiness kill them. Grandin argues that industrial slaughter should be as peaceful for animals as possible. But it turns out that cattle rendered calm by Grandin’s architectural designs turn the grimmest work of agribusiness—slaughter—into a more efficient and emotionally palatable process. Calm cows are more likely to go gently. And cows who go gently—say, by not thrashing around inconveniently before being shot in the head with a steel bolt—enhance productivity. When Grandin’s relationship to industrial agriculture is placed in this context, the welfare benefits her slaughterhouses offer are significantly diminished. On one side of the scale, cows raised under horrible feedlot conditions are spared a few moments of anxiety before their throats are slit. On the other, industrial agriculture per se is not only reified as a legitimate (and more productive) practice, but it becomes in the eyes of consumers a welfare-oriented endeavor. Thus agribusiness, which benefits from momentarily Grandin-pacified cows, wins. In an age of welfare concerns, Grandin serves as industrial agriculture’s angelic handmaiden. Consumers, who get a little conscious balm when they learn that meat came from a Grandin-designed slaughter facility, also take something positive from the arrangement. Even worse, a closer look at Grandin’s work shows that it’s not always what it’s cracked up to be. Her designs can be terribly flawed. This point was made vividly by Vickery Eckhoff in a revealing Forbes article. In it, Eckhoff and Grandin watch a video together of a horse slaughterhouse designed by Grandin. Grandin’s excuses for the abuse horses experience speak volumes. When it comes to the Grandin-agribusiness relationship, the fiction of genuine welfare is carefully managed—again, with journalistic support. Earlier this month, Grandin spoke at the American Farm Bureau Federation. The event was like a Kabuki ritual. Every move and message was deliberately calculated and strategized. Big Agriculture earned kudos from welfare watchers for honoring Grandin—the HBO-honored poster woman for animal welfare—with a Distinguished Service Award. Grandin replied with a speech that breezily called on big agriculture to be more transparent. “We need to look at what is optimal not what is maximum,” she said. What a terrific deal for all involved—sort of like being audited by your grandma. Agribusiness, advised to be “optimal,” gets the Grandin-welfare-bump. Grandin, another award to hang on her wall, gets paid. More cows than ever continue to die. This strikes me as an arrangement that, at the least, would make a smart journalist skeptical. I am delighted to read this post. I have felt this way about her since I read the first article of her work years ago. I was appalled then and I remain appalled. Grandin an animal welfare person? I don’t think so. What she does is akin to teaching rapists to “be a bit more gentle as you penetrate–the woman’s post trauma stress might be lessened. And if you are going to murder her afterwards, hide the knife for awhile. She won’t be so traumatized when you kill her.” I would very much like to see PR photos of her *with* animals as they are being slaughtered, with some real blood on her hands, not hugging animals who are not on death row. Do I think it’s a good thing for the poor animals who are about to be slaughtered to have a few moments of peace before the terror of having their throats slit or being shot in the head? Yes, at least as long as there are still humans on the earth who insist on eating animals. But to glorify the person who created these contraptions and to include her in the circle of thousands of true animal welfare professionals who work hard everyday to *save* lives is a travesty. Thank you for this post. What you say here, Teresa, is so very true. I agree completely. Well said Teresa! I agree with you (and James) 100%. James, thank you for finally saying what so many of us have been thinking for so long. Just read this interesting quote from Temple Grandins book Animals in Translation hard cover page 179 “If I had my druthers humans would have evolved to be plant eaters, so we wouldn’t have to kill other animals for food. …I’ve tried to eat vegetarian myself” Then she goes on to say that she thinks because she is autistic that she has a different metabolic system than non autistic people that prevents her from being able to be vegetarian. Found this interesting, that if her dietary voyage into being a vegetarian, had been successful, her mantra might be entirely different! Quotes from books written by Temple Granding, I think these quotes say it all. I have personally spoken with Temple regarding horse slaughter and she dismissed the aspect of the drugs given to horses, which are NOT raised for meat and I found that very unprofessional and definitely not dealing with scientific evidence, because I am SURE that the companies that produce drugs such as phenolbutazone or bute could prove that it was not a cancer causing drug they would as it would open up BILLIONS in profit for them! Theresa, when I interviewed Grandin about horse slaughter and asked her specifically about bute, she had to look it up — because she did not know what it was. Vickery, if she had to look up bute, then she is not only fabricating knowledge about the process of slaughter, but about her lifetime involvement with horses. You cannot, simply cannot, be involved with equines without encountering bute. We call it “horse aspirin” because it’s in everyone’s barn medicine chest. Grandin’s alleged horsemanship must either be at those “hop on hop off” rental barns with miserable horses (where you never get to see the tack room), or at equestrian facilities too ignorant and brutal to offer pain relief to sore horses. Eight year old Pony Club and 4H kids know about bute! How is it possible to design slaughter facilities for animals 50% of whom are sourced from race tracks and know nothing about administered drugs—when 100% of TBs receive bute? How? This is spot on. Grandin has been nothing more than a scripted mouthpiece for Big Ag. To couple her name with animal welfare is an insult to the millions who truly champion for those without a voice. Thank you James McWilliams for a very insightful article. It has long been my impression about Grandin that autism would not necessarily be a path to moral empathy with animals revealing any special insight. The slaughter industries as you point out however co-opted her to shield themselves from criticism as if she were some oracular source of truth beyond reproach. What a curious combination Grandin and slaughter industries make ! A supposed empath who is really a case of arrested moral development (perhaps) and an industry predicated on ruthless profiteering with no empathy whatsoever for its victims ! One of the major issues for people that have autism or aspergers (e.g., high functioning autism) is that they lack the capability for empathy and ‘normal’ emotional attachments. They also have difficulty adapting to events and ideas that fall outside of their world view. I lost respect for Dr. Grandin a LONG time ago because of how she will justify events that clearly depict abuse, cruelty, pain and suffering. Big surprise that the meat industry is an advocate for her…NOT! “The notion that Grandin’s autism provides unique insight into animal perspectives curries considerable favor with the general public, thereby further enhancing her credibility and reputation as a person who cares deeply about animals. Big Ag plays on this association brilliantly. Journalists help them do it.” This quote caught my attention because it seems ironic that an “esteemed” Ph.D person would then play on the urban myths that autistic people can have an enhanced special relationship with animals–compared to non-autistic people– when there is absolutely no scientific evidence indicating this is true. I would guess that in order to have a special relationship with animals you would need to feel empathy for them and compassion for their lifestyles which are often harsh. For example, I find that I feel empathetic towards much of the wildlife in my yard when we get brutally cold weather and they are exposed to the elements. There is nothing about autism that would make me more empathetic so it is kind of an insult to people who are not autistic to make a claim that you (an autistic person) are able to automatically have this specialness with animals. I don’t even have to spend much time with a particular animal to feel empathy and closeness for it. I can see whales in Japan being slaughtered on a video and feel a terrible sense of sadness and despair on behalf of it. I don’t think this is any special value that I have. I think millions if not billions of people have this trait. It is not complicated–I think we have evolved to feel closeness to all of nature including animals if we just allow it in ourselves. So it is a scam when we hear these words coming out of her mouth. I have to admit that I have had mixed feeling about her over the past. I have read one of her books about animals and found it quite inspiring. Her thoughts about dogs and their desire to “seek” and play was interesting and I have increased my own dogs’ time so that they can explore and wander off leash under my supervision. I think they are very happy and content animals b/c of it. She has also stated that she thinks all slaughterhouses should have video cameras operating so that people can see through their own eyes what is going on behind closed doors. So some of her ideas are worth listening to, but overall I have to agree that she is part of the problem in the Big Ag industry and in some ways I do agree she is being “used”. They take the parts of her that will increase their profits (like helping the animals stay calm) and ignore the parts that would no doubt decrease profits–like video cameras in slaughterhouses. She is an opportunist and everyone has known for years where her loyalty and income is rooted. She cares little for animals and uses her autism as a base for her authenticity. However, her educational background and expertise lacks merit or raises her as an expert. Just another cold heart person making her living off the cruel and heartless slaughter industry. I have the distinct pleasure of spending a day with Temple Grandin at the State Conference for Autism. Over the years she has dedicated her life to the humane treatment of cattle. Those who have expressed contempt for her being ‘used’ or ‘profit gains’ are way off base. Why shouldn’t she have a career? … she has dedicated her life to the well-being of animals, as well as, encouraging those persons diagnosed with autism reach their fullest potential. She has the credentials … she has the dedication, and the will to make a difference! I’m inclined to agree with the article. I can’t speak as to her dealings with autism, but I do not believe that Temple Grandin has dedicated her life to the well-being of animals. I see her as “a gimmick for profit”. Why isn’t she against horse slaughter? We don’t eat horses in the United States. She’s trying to make the inhumane commercial slaughter of horses “less inhumane” when she should be shouting that there IS NO humane way to slaughter horses (or any animals). Period. One thing I don’t think anyone has mentioned here is that there is a reason to keep animals as calm as possible while they are being killed – and it has nothing to do with easing their suffering, nothing to do with the well-being of the animals: it has to do with the quality of the meat! The more fearful the animal, the more adrenaline is produced which makes the meat tough. That’s the real reason. She likes her steaks tender. I am an advocate for animals and I am a vegetarian. Slaughter is bad for animals but meat is bad for people and raising all those cows is bad for the planet. 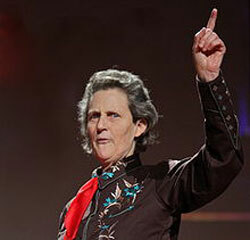 But one thing is for sure: it isn’t bad for Temple Grandin. Need I say anything about those gimmicky shirts she wears? Her “I’m Temple Grandin and I’m special” uniforms? I don’t think anyone is saying she should not have a career. My point is that she has intelligence and talent that is being used (in my opinion) in ways that do not always help animals. She has a lot of influence and as the article stated she is highly esteemed by the public. So she is in a favorable and highly influential spot. But when you create slicker ways for animals to be slaughtered –although perhaps more humane in lessening the animals’ fear, are you really working to improve the plight of animals? Or perhaps you do not think animals are suffering in the hands of Big Ag? No doubt the woman has talent and intelligence. I am not bemoaning that point. But being “autistic” has no bearing (scientifically) in being able to work and understand animals. So in that sense I think she is disingenuous. And of course she is being used! Big Ag like most of corporate America is basically pathological. They have no morals and money is their principle driving force. Personally I feel ethically obligated to question and critique their policies and means of production when they objectify animals, negatively affect climate change, pollute the environment, destroy ecosystems, create “ag-gag laws” to stop journalistic investigations and influence Congress with millions of dollars for lobbyists. This response was for Judi Ellen Duffin (above) . Because of her involvement with former WY State Rep. “Slaughterhouse Sue” Wallis (deceased), I have never trusted Temple Grandin. I also saw a film of Grandin standing in a group of horses, supposedly describing the horses’ emotions. Temple read them wrong. (Maybe it was the cameras and not Temple who made the horses uncomfortable?) Anyway, I trust the horses’ reading of Temple… which wasn’t very favorable. I also trust my own instincts. And I think she’s bad news for animals. Sorry Judi, but I have to disagree with you on this one. I do understand that your admiration has more to do with her work in autism than in animal slaughter. Everyone has to make a living somehow. Some of us go into music. Some of us work in the predatory inhumane commercial slaughter business. Sorry. It’s a choice. I was in an ethical dilemma a while back about Temple Grandin. I knew she had autism. As a vegan with Asperger’s Syndrome(high functioning autism),I was torn between my morals and ethics as a vegan. I chose my morals and ethics because I cannot and will not support anyone who consults and encourages the slaughter of animals. Looking back,I know I did the right thing,because it’s not about me,it’s about the animals. I disagree completely. I have read her books and followed her closely. She is a pioneer in the industry to teach the meat industry to be more kind to animals, and what is wrong with that? What she has created is the ability to say that all animals have feelings and should be treated with respect, even in slaughterhouses. She is not a hypocrite since she does eat meat and does work in the animal science industry. What is wrong with that? Just because someone disagrees with her practices, does not make her wrong. She is criticized because she is willing to say things that need to be said and other people are scared to say. There is nothing wrong with that. This article is right on. I think she gets an uncritical pass because of her autism. People dearly love a triumph over adversity story and are unwilling to ask uncomfortable questions about her and animal agriculture. You neglected to mention that People for the Ethical Treatment of Animals gave Grandin an award for being a “Visionary,” The Humane Society of the United States refers to her as a “[r]enowned animal welfare scientist,” and many other so-called “animal advocates,” do not recognize her as a sock puppet for industry and, indeed, hold her out as having some deep and almost mysterious insight into animal welfare. So the problem is not that journalists turn to her; the problem is that journalists turn to her because the “animal movement” points them to her. I have been writing about the relationship between Grandin and the “animal movement” since the mid-1990s. I know that you and I disagree about the welfarist movement but it is undeniable that it is the welfarists who have provided Grandin with the aura of expertise, not the media. Thank you for pointing this out. I was not very aware of the “closeness” many animal groups have with her. Thank you Professor Francione for pointing out that the animal welfare movement has used Temple Grandin as a mouthpiece and a tool to further their interests. What Grandin does and has done is despicable, but it pales in comparison to the audacity of welfarist animal rights groups who bestow upon her an aura of heroism based on her life’s work in the killing industry. How appalling. HSUS’ Paul Shapiro has frequently referred to Temple Grandin in glowing terms, often using the “renowned scientist” description when praising her. Farm Sanctuary’s Gene Baur had Temple Grandin supply a promotional blurb which prominently appears on the back cover his 2008 book, and Farm Sanctuary’s (and formerly PETA’s) Bruce Friedrich has also been known over the years to refer to Grandin in a very reverential manner, as if she is actually a friend to — and a positive force for — farmed animals. Here is a link to the 2014 HSUS “All-Stars” self-congratulatory promotional video choreographed by the “Farm Animal Protection” division. The piece is obviously very calculated and rehearsed, so it’s no mistake that two of Temple Grandin’s books are strategically displayed right off the bat at the 15 second mark. This leaves zero doubt that she is being deliberately touted by HSUS as a champion for farmed animals. The ongoing promotion of Grandin by many in the “farmed animal protection” arena has definitely helped to make her the go-to authority of so-called “humane slaughter”. She’s making a nice living off of the backs — and every other body part — of the farmed animals who she betrays with her “expertise”. The meat industry uses her and they do not universally respect or embrace her. Check out Trent Loos recent blog post to see ample evidence of that – the industry feels that she’s far too lenient in her views. Grandin has done a fair bit to reduce some of the horror of slaughter for cows but nothing much for horses at all. Of course, most vegan abolitionists don’t like to see any incremental improvements to some of these slaughter practices because they think it means that it will be that much more difficult to eliminate killing animals entirely if the process is made “more humane” to any degree. I am familiar with Ms. Grandin’s work and found it appalling that if she really has some inside track into animals’ feelings because of her autism that she remains so untouched and unfeeling toward their killing, no matter how “gently” (ridiculous!) they go to their death. I’ve seen what she considers the “correct” way to kill a horse and I challenge anyone with the tiniest amount of compassion to agree with her. She is obviously being used by the industry as their “proof” that slaughter is a “good death” based on her acceptance as an autistic, and therefore more sensitive person in this regard but I don’t see her as such. I see an unfeeling person with a perverted view in justifying slaughter. Does autism have anything to do with it? I don’t know. But it sure doesn’t manifest itself in anything but an unfeeling distance from what is taking place. I don’t know whom I find more troubling, the industry using her or her using some imagined insight that never manifests itself. [ Animal welfarist Temple Grandin, who designs “humane” ways of leading the animals to their execution, was quoted as saying that her methods of slaughter improve the quality of the meat. MS. Grandin is the darling of the oveblown meat industry due in no small part to her input for McDonald’s slaughtering and proccessing plants. The upswing of the killing of hundreds/millions of animals for the Quarterpounder and Big Mac caused problems of handling. Grandin was employed to come up with the physicality of the plants, the “pipelines” forcing the cattle into smaller chutes and thus allow killing to be unrelenting and unstoppable due to clogs or misbehaving animals. the sweetheart of the industry. the fact she had developed her mental state to overcome some drawbacks only added fuel to the fire of brainwashing the public that all was well and due to her intuitive state (being incapable of higher connecting thoughts, so they said), she was able to understand the limitations of the animals in facing their own destruction. For horses, she allowed they had a bit more sensitivity, but at the end, could be manipulated in the same manner as cattle. Humans have and always will eat meat. Depending on your cultural bias certain animals are for eating and others are for pets. Unless you are a vegan you need to get off your soap box and stop being a hypocrite regarding slaughter of ALL ANIMALS. Having said that I am all for developing ways to make slaughter of animals more humane, if slaughter and humane can be used in the same sentence and make any sense. There are over 170,000 thousand unwanted horses each year in America, what are we to do with them? Then don’t call killing billions of animal for food “humane” and don’t market their brutal lives and painful deaths as a bucolic life for farm animals. Don’t lie about what you do with the animals when you “raise” them and don’t try to pass Ag Gag bills that prosecute people who investigate that brutality. If you want to support eating meat, then come clean and talk about exactly what goes on in this business. When you state ” Having said that I am all for developing ways to make slaughter of animals more humane, if slaughter and humane can be used in the same sentence and make any sense” you seem to understand that slaughter and human really cannot be used in the same sentence. That is a major contradiction yet you think it is OK to eat meat. Eat it, but at least admit that eating it is cruel and that taking the lives of farm animals is no less cruel than imposing that kind of death on dogs, cats or any other animal, wild or domestic. No, they are not unwanted. Well, there you have it. Unless you are a vegan, you are playing unfair to point out the vicious disrespect for life that “meat and always eaten meat” humans crave. And finally – we have confirmation – the 4 billion animals who lost their lives plus 170,000 (he said it) were UNWANTED. I’m no psychiatrist but the epiphany of hatred for females (just breeding machines), the hatred for innocents (male chicks ground up, male calves sequuestered and butchered as specialized meat, equine foals left to die on filth feed lots or used as target practice, etc, kicking and throwing of the newborn), hatred for compassion (it is a necessary evil to brutally mechanically slaughter (wanton brutal carnage)) and finally, hatred for intelligence IS A DISTINCT sign for intervention. Animal cruelty laws fail, law enforcement fails, morals fail, violence succeeds. I can change this. I can stop participating. I AM A VEGAN. In 2006, UN report instructed this global society to terminate the meat industry – the major cause of fouling our ecosystems, killing of wildlife, killing of the ocean and destruction of protections against sicknesses (through ignorant and reckless use of antibiotics). Do it. We must stop participating. I blindly believed in her special abilities. Without totally discrediting her work, I wonder whether her autism doesn’t render her NUMB to suffering. Surely she helped reduce animal stress and convinced me that “we all die”. I still question a cow’s understanding of death like we do. Occasionally I hear about a pig/cow who cry before slaughter. Could it be that some of them have the capacity to comprehend? So, what happens when the first person decides to say, “plants are living things and it is cruel to eat them?” Will humans stop eating, and just starve themselves through some “ethical” dilemma? Amazing – everyone thinks this woman is a saint. We’re living in bizarro world. Ya wanna be humane? Go vegan. It’s easier today than ever. Anything less is NOT humane.